Following the exciting news that the Duke and Duchess of Cambridge will pay a debut visit to Bhutan this spring, we thought we’d offer them an insight into what makes the Thunder Dragon Kingdom such a unique and special place to travel to - whether on a royal visit or simply on holiday. The Himalayan kingdom of Bhutan is ruled by the Dragon King – the Druk Gyalpo. The current king is Jigme Khesar Namgyel who is the fifth Dragon King. His reign began in December 2006 following his father’s abdication from the throne. He married Jetsun Pema Wangchuck in 2011 – coincidentally the same year that William and Kate got married - and they are expecting their first child this spring. Bhutan remained a largely remote and isolated kingdom until 1974 when the first tourists were permitted to visit. Prior to this, only explorers, climbers and official guests were invited to enter the country. The banning of TV until 1999 also increased the sense of isolation from the rest of the world. Until the first airport was built in Bhutan in 1983, entry was only possible via road from India. The national airline, Druk Air, was formed at the same time making it considerably easier to take a holiday in Bhutan. Tourist numbers were initially restricted to just 200 per year. This is no longer the case, although limited air services and relatively high charges for tourism services keep visitor numbers low compared to other Himalayan destinations. Bhutan is known as one of the most content countries in the world and measures its wealth not in GDP but ‘Gross National Happiness’ (GNH). The four main pillars of GNH are - good governance, sustainable socio-economic development, cultural preservation, and environmental conservation – all of which contribute to the health and wellbeing of its citizens. To help maintain the health of the Bhutanese people, the sale of cigarettes is banned. Tobacco products can be imported but smokers must have a valid customs receipt if they want to smoke. Traditional dress is still widely worn with men wearing a long, patterned robe called a gho and women wearing a kira – a floor length dress. We won’t be surprised to see William and Kate adopting this dress at some point on their visit for a royal photocall. Festivals, or tsechus, are one of Bhutan’s greatest cultural traditions and no visit to the kingdom is complete without seeing one of these vibrant social and sacred occasions whether large or small. The fabulous costumes, elaborate dances and colourful spectacles make for a truly unforgettable experience. Hopefully William and Kate will have the chance to attend one during their visit. 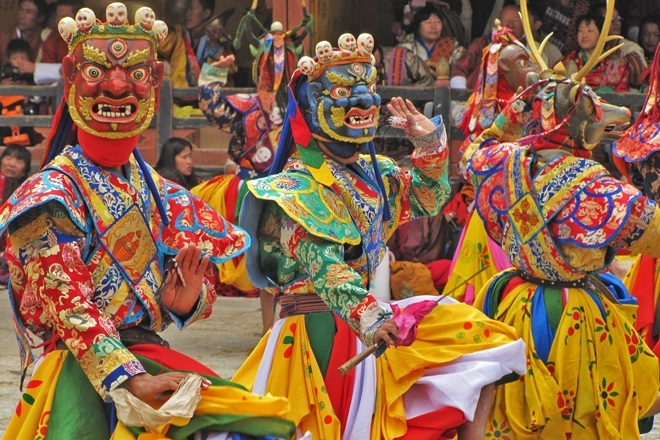 Read our blog to discover more about Bhutan festivals. Bhutan’s national sport is archery and it’s the only Olympic sport that Bhutan entered in 2012. Unlike our more sedate version of the sport, Bhutanese archery is a rowdy event with much drinking beforehand and ‘sledging’ of opposing team members during the competition. Archery tournaments are also great social events with every village having its own archery field. The practice of traditional crafts is still highly prized in Bhutan. Known as the Thirteen Arts, the most revered include carving, papermaking, painting and weaving. In fact, Bhutan is renowned for the high quality and sophistication of its hand produced textiles with examples of Bhutanese weaving making an excellent holiday souvenir or even a gift for royalty. 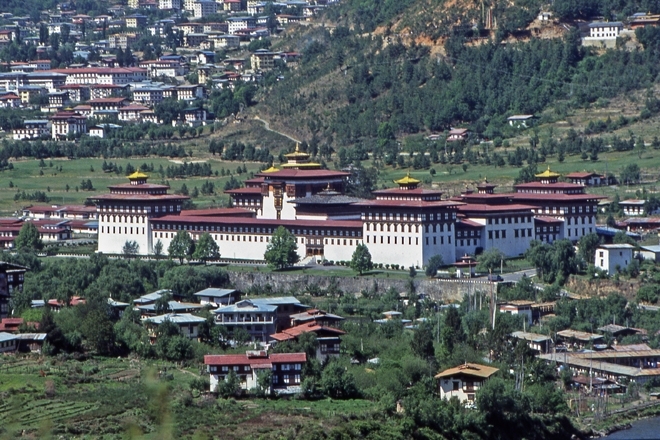 Visitors to Bhutan cannot but be impressed with the unique architectural style of the Thunder Dragon Kingdom. Huge dzongs (monastery/fortresses) dominate the towns with their imposing white walls, prominent towers and ornate red and gold rooves. Village houses are built in a style not dissimilar to Swiss chalets featuring elaborate wooden cornices, shingled rooves and an open attic space for storing hay or drying chillies. Bhutanese houses are often decorated with carved wooden phalluses hanging from the four corners of the roof or colourfully painted on to the side of the house. They are believed to ward off evil rather than being related to fertility. The vast majority of Bhutan is mountainous with the highest Himalayan peaks to the north. The tallest of all is Gangkar Punsum at 7,550m/24,770ft. It is also the world’s highest unclimbed mountain due to current restrictions on mountaineering. Mountain Kingdoms’ MD, Steve Berry, led one of the last expeditions to Gangkar Punsum in 1974 but was unable to reach the summit due to bad weather. You can watch the original film of his expedition to find out more about his incredible experience. The national animal of Bhutan is the Takin - this strange looking beast was once likened to a ‘bee-stung moose’. Bhutan’s rarest and most elusive creature however is the Migoi or Yeti, and Bhutan is the only country in the world that has an official Yeti reserve based in Sakten in the far east. The national flower of Bhutan is the Blue Poppy. This beautiful and mysterious plant takes two years to grow, flowers just once and then dies. Next time we’ll be giving the royal couple some ideas for what they can do whilst visiting this wonderful Himalayan kingdom. In the meantime take a look at all our holidays to Bhutan or get some inspiration for a Tailor Made trip of a lifetime.